"From Petaluma to Peshawar, these amateurs are arming themselves with GPS devices and easy-to-use software to create digital maps where none were available before, or fixing mistakes and adding information to existing ones", said the NY Times, referring to the volunteer mapmakers contributing to digital maps offered by Google, OpenStreetMaps and others. While both Google and OpenStreetMaps are community created, the main difference between the two is that OpenStreetMap provides its map data under a Creative Commons license and the maps created by users of Google Map Maker are the intellectual property of Google. Open Street Map (OSM) is a geo project that lets anyone update it. Volunteers donate time and energy uploading GPS tracks, building supporting software, and editing the core data. OSM is growing quickly. As an open data project, OSM makes its data freely available to anyone. This enables custom mapping applications like the OSM Cycle Map. It is also being used commercially by a real estate site Nestoria and by VC-funded startup Cloudmade. Google Maps has varying levels of coverage of the entire globe (as do its competitors like Microsoft Bing Maps and Yahoo! Maps). Most of the data that is used by Google Maps and displayed comes from Tele Atlas (owned by TomTom) and NAVTEQ (a wholly owned subsidiary of Nokia). More than year ago Google released the ability to move addresses or add a new place. With this feature any logged in user can make an edit; you can even watch the edits in a realtime viewer. If your change is accepted it will show up in Google Maps. Road geometry and address changes derived from Tele Atlas data will be sent back to Tele Atlas to help improve its information. The updated data will eventually make it into new-owner Tomtom's GPSs and potentially Google's competitors who also use Tele Atlas. The data collected via MapMaker will not be shared with Tele Atlas. Google is gradually dropping its dependence on the traditional commercial map vendors like TeleAtlas and Navteq. Instead, it is relying on unpaid volunteers to create digital maps of 140 countries, including India, Pakistan and the Philippines, that are more complete than many maps created professionally. One such volunteer mentioned in the NY Times story is Faraz Ahmad, a 26-year-old programmer from Pakistan who now lives in Glasgow, Scotland. He took one look at the map of India and decided he did not want to see his native Pakistan left behind by its traditional rival. So he began mapping Pakistan in his free time, using information from friends, family and existing maps. Faraz Ahmad is now the top contributor to Google Map Maker, logging more than 41,000 changes. India-Pakistan rivalry took on a new dimension when Faraz tried to work on Azad Kashmir, and he found that Map Maker wouldn’t allow it. He said his contributions were finally accepted by the Map Maker team, which is led by engineers based in India, but only after a long e-mail exchange. In addition to Faraz, there is a whole community of Pakistani volunteer programmers and mapmakers currently adding roads, streets, businesses, crossings and various points of interest (POIs) for areas for which there are no maps defined yet. Then other users approve or disapprove the additions and changes. Eventually, the maps are posted to Google maps and Google maps mobile. Fairly detailed Google maps for mobile are available today for Pakistan. Such searchable, navigable and routable digital maps are expected to help grow real estate, travel, transportation, retail, financial services, healthcare and emergency services and other service sectors. The reason why mobile maps have come first is because of the large user base of about 80-90 million mobile phone subscribers. Pakistan has a vast data network over GSM/GPRS/EDGE and EVDO and there are no alternative street navigation systems, with the exception of fairly expensive car navigation systems costing tens of thousands of rupees. Google has a database of cell Towers in Pakistan, and with the help of these towers it identifies the location of the user in real time, within about 10 to 20 meters and sometimes up to 3000 to 4000 meters, depending upon the density of cell towers in a given area. If the mobile phone has data service enabled, the user can download the Google mobile map application from m.google.com/maps. After downloading the application and installing it, it is available in the applications folder of the mobile phone. 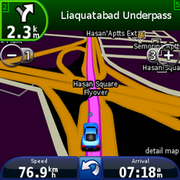 A number of GPS enthusiasts have also developed Garmin compatible navigation maps for Islamabad, Lahore, Karachi, Peshawar and a few other cities in Pakistan. But it's rare to see car navigation systems in Pakistan. As painful as it is to watch the constant media coverage of blood and terror in the streets of Pakistan, the NY Times story of volunteer cartographers and the recent Karachi Fashion Week illustrate that there is more to Pakistan than meets the eyes or reaches the ears of the passive consumers of the western and Pakistani news media. I am glad that there are enough volunteer programmers and amateur cartographers in Pakistan to attempt to build detailed digital maps and maintain them in their spare time--without the assistance of commercial vendors like Tele Atlas and Navteq who did the same for North America and Europe at huge costs. The main contribution of the government under President Musharraf was to invest in the growth of the telecommunications, higher education, and the Internet infrastructure, a pre-requisite for online volunteer collaboration in projects such as map making. It shows what the Pakistani people are capable of doing with just a little help, in spite of the continuing institutional failures in Pakistan. As I have said before, and I repeat here again, it is better to light a candle than curse darkness. Thanks. I, too, find your blog very informative. I visit it once in a while to keep up with telecom related developments in Pakistan. I am glad there are enough volunteer programmers and amateur cartographers in Pakistan to attempt to do something about building detailed digital maps and maintain them in their spare time....without the assistance of commercial vendors like Tele Atlas and Navteq who did the same for North America and Europe at huge costs. It shows what the Pakistani people are capable of in the face of institutional failures in Pakistan. NEW DELHI: The search engine Google has amended its maps to show the entire state of Jammu and Kashmir as part of India. The correction came in response to the notice issued by minister of state for communications and IT Sachin Pilot to Google Inc for showing Pakistan-occupied Kashmir as part of the neighbouring country. After Pilot noticed the lapse, the ministry wrote to the website that maps available through www.google.com/insights showed certain parts of J&K as part of a different country. The notice said that wrongful depiction of Indian map could attract action under Sections 69A and 79 of the IT Act. Sources said the website had corrected the maps in its memory though a few pages would take some time to upload. It sets right what is a sensitive issue in the country. The showing of PoK as part of Pakistan had attracted strong comments from various sections. Schmidt said that the demographic composition of the Pakistani population was a great national asset and the Pakistani youth was talented and eager enough to get acquainted with information technology, often on their own. He assured the Prime Minister that his company was willing to help Pakistan to spread information technology throughout the country. He said that improved connectivity facilitated the youth in getting themselves gainfully engaged, which in turn was critical to combat extremist tendencies in society. The Prime Minister said that he recently announced a Venture Capital Fund of US $10 million and would like Google Inc. to also contribute to it besides its Social Innovation Fund. “I have, recently, directed the establishment of Universal Service Centers at Union Council level across Pakistan. The aim of these centers is to provide Government to Citizen and Government to Business services acting as an IT hub in rural areas. I would also like your support to make these centers successful,” the Prime Minister added. Schmidt said that it was also important to formulate an economic development strategy. Google has faced action from Pakistan, including threats of being blocked if it failed to cooperate in restricting access to objectionable content available on Google and its various services including video sharing social network YouTube, which was blocked in 2010. Pakistan has also sought cooperation from Google to clamp down on accounts operated for and by terrorists. The government of Pakistan is about to propose a law that would make it illegal for independent bodies to engage in mapping. The Land Surveying and Mapping Bill 2012, proposed by the Ministry of Defence (MoD), transfers all mapping authority in Pakistan to Survey of Pakistan (SoP), which reports to the MoD and takes its orders from General Head Quarters (GHQ). SoP is the national organization responsible for surveying and mapping requirements of the Armed Forces and civilian departments — in that respect, at least, its origins are similar to those of the United Kingdom's Ordnance Survey. Over the past decade, however, the advent of computer-aided cartography and the availability of satellite imagery have radically changed the realm of maps and Geographic Information Systems (GIS). Easy access to this kind of technology has helped individuals and organizations to support their own efforts at social and relief work. For instance, after the floods of 2010 that devastated huge swathes of the country, relief workers created and used their own mapping resources to allocate aid efforts more effectively, thus saving many lives. This year Umar Saif, MIT Technology Review’s Innovators Under 35 award winner, used mapping technology to detect the spread of Dengue fever in Lahore. Early detection prevented the virus from becoming an epidemic. The Punjab government initiated an Innovation Punjab campaign with the help of Google. The campaign brings inexpensive Internet access to rural youth, with the goal of empowering the next generation of tech innovators. 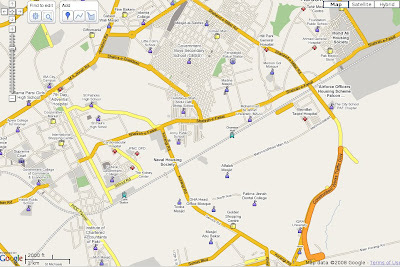 During the 2010 crisis, several NGOs and relief workers mapped information using Ushahidi. If the proposed bill is passed, Google Maps and Ushahidi would be banned from Pakistan. All the hard work invested by local and international relief workers, volunteers and organizations would be in vain. The MoD's position is that in the absence of a national law and regulatory authority for mapping, it is impossible to keep a check on unlawful activities — especially in sensitive areas. They claim that the purpose of the poposed bill is to limit potential risks to sensitive information — to prevent duplicate mapping, which they say would be a financial burden for the state and to transform the SoP into a national mapping agency. Since mapping data can be obtained easily from non-governmental sources, this undermines the logic of the MoD's case. There is also the question of whether a ban on mapping can prevent "unlawful activities in sensitive areas." 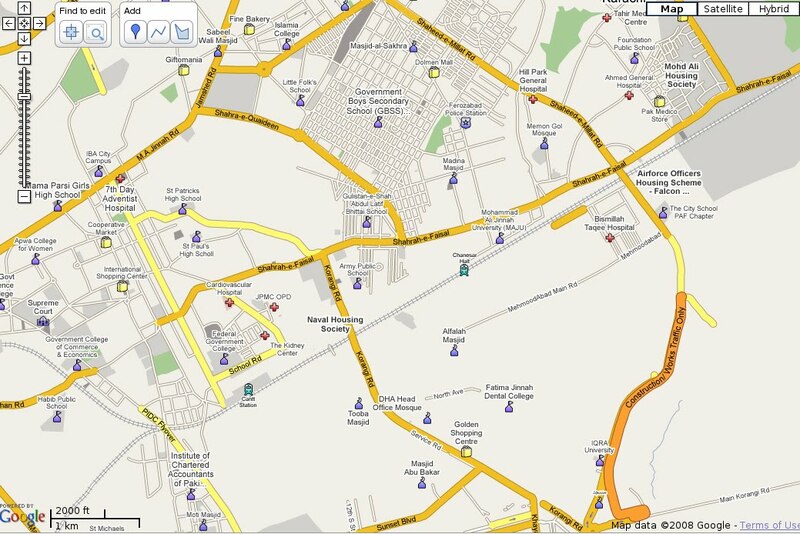 Online maps and satellite imagery, GPS-enabled devices and in-car navigation are all easily accessible in Pakistan. If the bill passes in to law, the SoP will be the regulatory body controlling all mapping activities. Any other body wishing to create a map will have to apply for permission to do so — and can expect to have their activities and their outputs controlled as a result. The bill also assigns responsibility for various parts of the mapping infrastructure (such as survey markers) to regional and district administrative bodies. Those who remember the woeful ineffectiveness of those bodies during the floods of 2010 may wonder whether such a transfer is either wise or practical. In addition to installing itself as the single point of control for all mapping activity, the MoD will also delegate to the Pakistan Army responsibility for enforcing the bill. "In Peshawar?" was a common reaction by confused members of the Pakistani and international technology community when told about the location of the country's first Digital Youth Summit (DYS). The city's reputation is often unfairly dominated by insecurity, yet over 300 young men and women from across Pakistan showed up to the two-day conference this week, making it the largest youth tech conference in the country and marking Peshawar's emergence as a hub of innovation and technology. More than 60% of Pakistanis are under the age of 30 and while unemployment is rising, it is not possible for the government to provide jobs in the public sector to this huge mass of youth. On the other hand, a youth-led national and organic movement is growing, changing perceptions about "secure" public sector jobs and creating an ecosystem for entrepreneurship, freelance jobs, and technology. Peshawar is at the helm of this change. Starting with a civic hackathon in January 2014, 150 young techies from across Khyber Pakhtunkhwa province (KP) demonstrated their energy and creativity for solving prevalent civic issues through technology. Twelve winners of the hackathon became fellows at the government of KP’s Information Technology Board (KPITB) and began developing their own civic startups. Their prototypes from the hackathon are now turning into full-fledged apps. "Traditionally we wait for governments to solve citizens' problems. This helps citizens solve government’s problems, which hurt all of society," said Muhammad Ibraheem, one of the fellows. His team’s app, No Kunda, allows citizens to take pictures of electricity theft they see in their community and report them to authorities. Another, DocSeek, aims to be a “Yelp for government health facilities in KP”, enabling residents to easily find nearby government health facilities, complete with user reviews. The fellows presented their apps and experiences at the Digital Youth Summit as one of the summit’s 28 sessions over two days. Over 66 speakers from across Pakistan and the world converged to engage with local youth on topics of fostering innovation, startups and freelancing jobs through the digital economy. The participants included innovators, entrepreneurs, and an exciting group from emerging startup communities. Youth interested in building digital livelihoods heard from investors on how to attract funding, practical tips on writing proposals, and the opportunities available to become part of a global digital economy, such as through micro-work. Along with the sessions, there was an expo of digital innovators showcasing their products. The attendees cherished the opportunity to meet successful entrepreneurs, with sessions consistently running out of time for questions, and speakers swamped after the sessions by aspiring young innovators. On this uneven landscape (averaging two years of quarterly data from 2010-2011), Israel produced almost as many edits (215,333) as the rest of the region put together (254,089). Graham and Zook have also tried to measure information density in the geoweb by looking at what Google indexes about a place (after all, this is Google’s mission statement: to "organize the world's information and make it universally accessible and useful"). The process is a bit meta. "We just ask Google Maps how much it knows about any particular place," Graham says, "and it returns that information." The researchers essentially set up a computer script that visits hundreds of thousands of points on the world’s surface, conducts a search for indexed content related to that point on Google, then stores the results in a database. "By aggregating all of that data," Graham says, "we can see interesting patterns about which parts of the world people are looking at and which parts of the world people aren’t looking at it." Think, for example, of a sandwich shop in a Detroit neighborhood on the other side of the digital divide that has no website, no Yelp reviews, no little red balloon on Google Maps. How do people find it? Surely this form of invisibility is bad for business. Graham offers up another example from his own research in East Africa, where he has studied how the Internet has impacted the tourism industry. He interviewed a Kenyan tour operator about why he recently started offering trips to Rwanda. "This isn’t a new challenge in cartography, to sort of represent the unknown," Graham says. "Mapmakers have been doing this for centuries. But we look to maps because we want to see what’s there, not what’s not there." From Tuesday, Google is cutting user edits from its Maps after admitting that it simply can't prevent online tricksters from abusing the system. Last month, the firm was forced to make some quick edits after a user noticed that someone had created a mythical park in Pakistan in the shape of the Android mascot robot relieving itself over an Apple logo. Another user spotted a similar bit of graffiti proclaiming "Google review policy is crap," and the firm has now decided to take action. "A strong user in our community chose to go and create a large scale prank on the Map," said Pavithra Kanakarajan from the Google Map Maker team in a forum post. "As a consequence, we suspended auto-approval and user moderation across the globe, till we figured out ways to add more intelligent mechanisms to prevent such incidents. All of our edits are currently going through a manual review process." While manual editing appears to be solving the problem there's no way Google's engineers can keep up, he explained, and any new edits were just adding to a backlog of things that need to be checked. So no more edits will be accepted until Google has worked out how. "While this is a very difficult, short term decision, we think this will help us get to a better state faster," Kanakarajan said. "More importantly, we believe it is simply the right thing to do to all of you, our valued users who continue to edit with the hope that your changes might go live as fast as you've been used to." The tech giant announced the launch of the project to highlight and promote Pakistan’s rich cultural heritage. Google has undertaken the project in collaboration with a number of local non-profit organisations which include the Citizens Archive of Pakistan (CAP), Mohatta Palace Museum, Heritage Foundation Pakistan, and others. Some of the sites that will be included in the panoramic view will include the ruins of Moenjodaro, Rohtas Fort and Shalimar Gardens and Fort. This is not the first attempt by Google to promote Pakistani culture. Earlier in 2012, the tech-giant had signed an agreement with the provincial government of Punjab to capture historical locations and cultural sites. The current project is more encompassing, as it includes cultural and historical sites from across the country. Pakistan is blessed with a rich and diverse cultural lineage. The origin of the current Pakistani culture can be traced back to the Indus Valley civilization, which existed around the same time period as the Egyptian and Sumerian civilizations.